Toasted coconut cold brew: Skip the expensive and highly-processed take-out cold brew and make your own version at home! This coconut coffee syrup is made with just 3 ingredients! It should be no surprise to you, if you’ve been around these parts for long enough, that I’m a pretty big fan of coffee-flavored treats. I’m particularly fond of these espresso dark chocolate coconut cookies, this cappuccino fudge cheesecake, these caramel frappuccino cupcakes, and these turbo-charged brownies with salted caramel peanut topping. Yes, it’s safe to say that coffee is a big thing here. It’s a “thing” I look forward to most about our weekends. That first hot cup on a morning where there’s no rushing around. Watching the sun come up from the porch. Pure bliss! My weekday mornings, of course, are a bit more hectic. And when June hits and the windows usher in that cool, dry early summer morning air, it’s ALWAYS iced coffee in my tumbler on the way to work. However, it wasn’t until this summer that cold brew finally took hold of me. 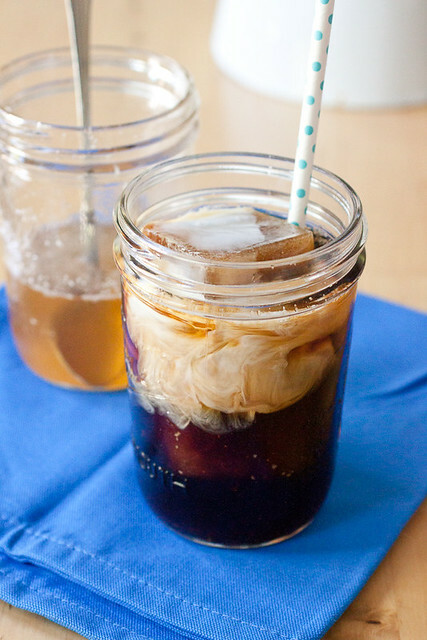 Enter this toasted coconut coffee syrup: the perfect cold brew or iced coffee sweetener. Simply made, it’s toasted unsweetened coconut steeped in hot simple syrup and then strained to leave a smoothly flavored coffee syrup. After it’s chilled and poured into a cup of cold brew, my commute doesn’t seem so bad. The flavored coffee offered by my favorite bagel shop in New Haven inspired this creation but there’s no comparison here. No preservatives or artificial flavors in this coconut syrup – just a hint of coconut in my now favorite cup of cold brew. This toasted coconut cold brew just helps make life so, so good. It’s the simple things, right? This cold brew is actually a coffee concentrate and it needs some water in the drinking glass to help mellow it out, unless of course, you’re into really strong coffee…then by all means skip adding water to your glass and go for the gusto! And here’s a hint for timing the parts of this recipe out: Make the coconut syrup while the coffee is steeping and chill it until cold so that it’s ready to use as soon as the cold brew is ready. This way, you’ll have everything ready to just pour and go! To make the cold brew: Grind the coffee beans on the coarse or French press grind setting (typically setting 1 or 2 on a burr grinder) or have your favorite coffee shop grind your favorite beans. If using freshly ground coffee (that you’re scooping from a bag of ground coffee), you’ll need about 1¼ to 1½ cups of coarsely ground coffee. Fill up a large pitcher with 2 quarts of water and stir in the coffee with a wooden or plastic spoon. Cover and allow the coffee to sit at room temperature out of direct sunlight for 12-24 hours. Strain the coffee through a double layer of cheesecloth or a paper towel (my preferred method) in a fine mesh strainer set over another pitcher. If you notice coffee grounds floating in the strained coffee, strain it once more. I don’t find this to be an issue with the paper towel method. Refrigerate until cold. To make the toasted coconut coffee syrup: Preheat oven to 425° F and adjust the top rack to the second notch from the top of the oven. Line a large baking sheet with parchment paper or a silicone mat and spread the coconut out in an even layer. Toast the coconut for 7-10 minutes until nicely browned and toasted, tossing after 5 minutes. Watch the coconut carefully as it can burn easily. Stir the sugar and water together in a small saucepan and bring the mixture to a simmer over medium-high heat. Simmer for 5 minutes, remove from the heat, and stir in the warm toasted coconut. Cover and allow the coconut to steep in the syrup for 30 minutes. Pour the syrup through a fine mesh strainer into a mason jar or resealable glass bottle to cool. Refrigerate for at least 2 hours before using. There may be some coconut residue in the syrup; if that bothers you, strain the syrup once more and if not, shake before adding to your coffee. To make the toasted coconut cold brew coffee: Add a few ice cubes to a glass, pour in 1 tablespoon of the toasted coconut coffee syrup, enough coffee to fill about 2/3 of the glass, add some cold water, and then add your desired dairy product (if any at all). Stir in some additional syrup if you like your coffee sweeter. Love this! Coconut is my favorite flavor in pretty much anything, and this sounds so fabulous because toasted coconut is even better than regular coconut. Love the idea of this syrup! I would never think to steep toasted coconut… but it sounds awesome! Toasted coconut iced lattes are one of my favorite coffehouse treats! I steeped coconut for the first time years ago when I made toasted coconut ice cream (also on the blog) and I was blown away by how the flavor comes through so strongly. Hope you enjoy this!! I so need to make this! I love cold brew coffee but I usually just have it with milk…this would make it way more fun! Oh yeah, I got really tired of plain cold brew at home especially since I was spending so much on flavored iced coffee from Starbucks. This is a great solution! This sounds like perfection. With school starting up soon, I need to make a big ol’ batch of this to get me going first thing in the morning. I’m confident you’ll love this, Kelsey! And congrats on everything exciting happening for you this summer!! This is all I’ve been drinking for a couple of weeks now, and let me tell you…pure deliciousness!!! You nailed the recipe, and I’m so grateful. Thank you!!! Love this! Was so easy to make! Any suggestions of recipes to make with the coconut flakes after ?